I am super excited to finally share these photos with you! Forget 'New Year, New Me', today it's all about 'New Year, New Home'. 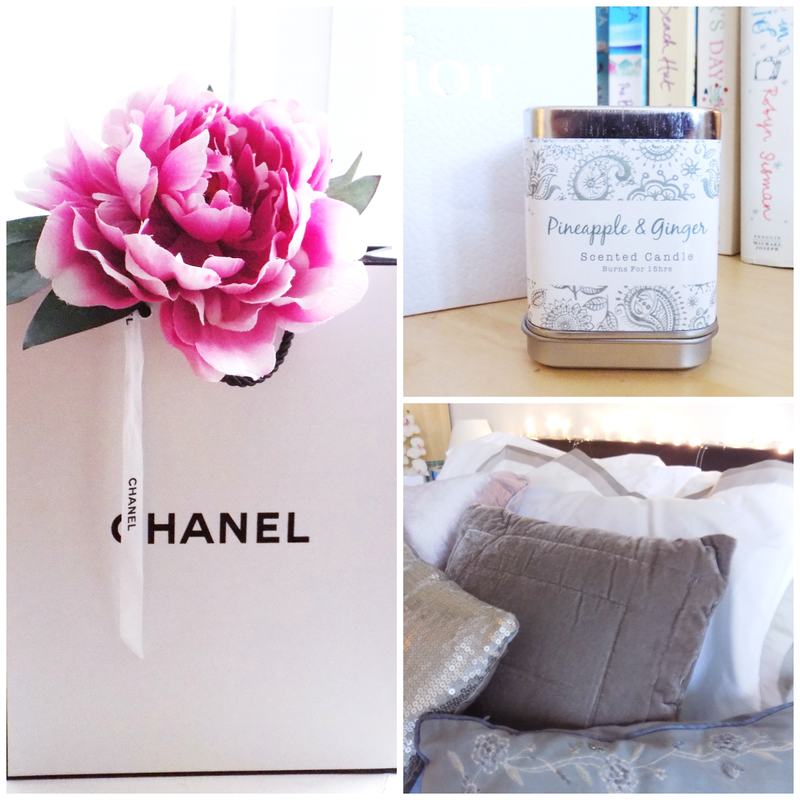 I have been wanting to update the bedroom for so long now, but with a to-do list as long as my arm which never seems to decrease in size, unfortunately it's always just been one of those things that doesn't take priority over the every day necessities, and gets pushed further and further down the list. So for 2016, I made it my goal to make it a priority once and for all and spruce up the room. Of course it helps a great deal when you've been very kindly sent some beautiful pieces from the queen of interiors; Laura Ashley. I have always been a lover of Laura Ashley for it's feminine, quintessential designs, since I was a little girl; I used to accompany my Mum to many a shopping trip (although they were most probably just 'browsing trips' looking back in hindsight! ), as it used to be her absolute favourite place. And so the love affair began with all things pretty and scrumptious and girly. When we first moved into our home over two years ago, I was due to give birth to Theo in just over a month, so my main priorities were getting the nursery finished, all furniture in place and sourcing kitchen and bathroom essentials, above prettifying our abode. For as long as I can remember, I have always dreamed of having somewhere to call my own home and having the pleasure of being able to decorate, create colour schemes and where all the furniture would go - it practically made me giddy with excitement. I was also wary to keep it all very neutral, taking Dan's non love of all things super girly into account, so a colour palette of cream, grey and black was decided. The only things I really added was a large piece of Parisian styled canvas above the bed (which was even a push to get the Mr's approval at the time!) 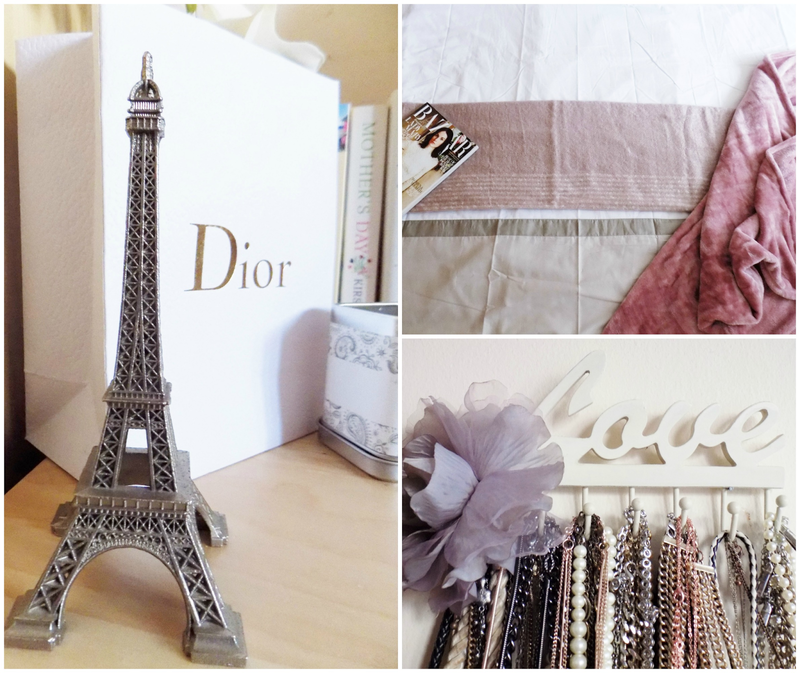 and kept all my pretty bits together over on my dressing table. Over the months, I eventually got fed up with the plainness of it all and began gradually adding a few more pretties; various faux flowers appeared here and there, I popped a small piece of artwork up and introduced a few more candles and cushions. Despite this, I felt the room was still lacking character. Cue: makeover. The room started off with a faint shabby chic vibe, but at the time I didn't want to go overboard, so I wanted to keep that aspect but also knew that I wanted to keep it still fairly minimal and neutral in colour. Which is where Laura Ashley fitted the bill nicely - their room designs and colour palettes are renowned for being soft and light and airy; combining classic elegance with modern chic, and that's the style I wanted to try and inject into our fairly characterless room. 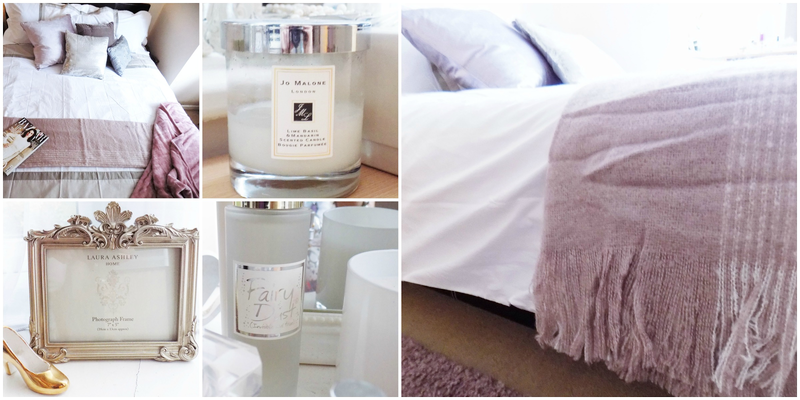 I opted for products that would still fit in with the neutral colour palette, but also wanted to add another subtle colour into the mix; I went for a lovely dusky mauve/ heather hue for accessories such as this gorgeously cosy, mohair-style Anastasia Amethyst Blanket and Nigella Pale Amethyst Velvet Cushion. I thought this lovely amethyst shade was a good compromise, with it not being so ultra girly as a full on pink or lilac; and also, it's a very classy, grown up colour - I am not sure at almost 26 years of age I'd really want to have a bright or baby pink splattered bedroom as I did when I was 16... the odd accessory here and there is much more acceptable. The main feature of this room makeover, has to be the oh so chic Imogen Dove Grey Duvet Cover - I think it's important to have a bedspread you love as the bed is generally the largest item in a room and therefore focal point. In the past I had a white cover with sleep related words in script all over it, and then a cream one with a shabby chic/ Parisian design, so this time, I really just wanted something unfussy, fresh and timeless. I must apologise for the creases - unfortunately our iron is on it's way out and can leave black marks on things (eek!) so I wasn't willing to risk it with this; I tried to air it out as best I could which did help a bit. In hindsight, I probably should have taken some 'before' pictures for a comparison, but to be quite honest, the room was fairly dismal before, apart from my dressing table, which hasn't really changed that much, so I'm not sure they would have enhanced this post a great deal. I, like many other females I'm sure, love a good 'scatter cushion', and would quite like to add more to this little display, but I know they infuriate Dan...give it a few months and I'm sure I can gradually introduce one or two...or three more (teehee). As well as the Nigella Pale Amethyst Velvet Cushion, I also opted for a lovely plump dark grey velvet style, for a bit of masculinity - this one is unfortunately no longer available, but I'll link a similar one at the end of the post. The other two I already had from years ago, but think add a lovely bit of texture to the mix. I used to have the fairy lights around my dressing room mirror, but every time we'd close the curtains, they would fall off, so I was inspired to add them to the top of the headboard instead which I think creates a lovely, cosy effect. They're battery operated as well, so they're also really handy to double up as a book light, which gives off a softer glow than the harsh light of the lamp. Final touches were made in the form of a few pretty accessories. I absolutely had to have this gorgeous, unique Marble Wall Clock, (which, FYI is currently down from £40 to £13.50 in the sale - amazing or what! ), because who doesn't love a bit of marble!? Finally, I thought a frame would be the perfect finishing touch, as I had never got round to putting any photos up, but that's something I really like to have in a bedroom as it makes it so much more personal. I chose the beautiful Patricia Champagne Frame (seen about eight images above) as I adore the colour and am a big fan of decorative, antique style frames such as these. 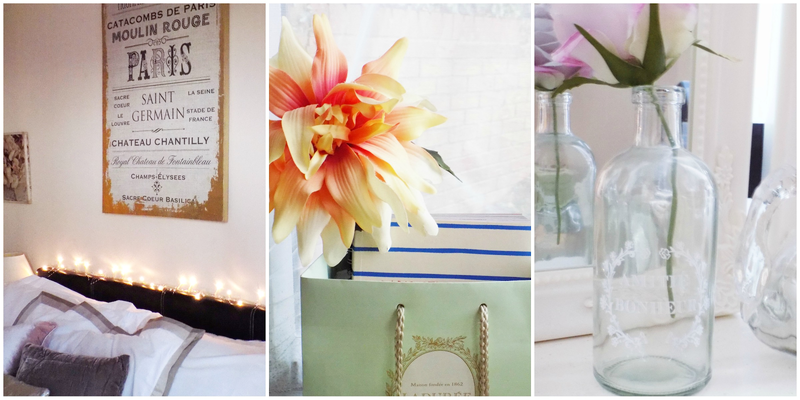 It's also the perfect size to pop on the windowsill or on the bedside table. Obviously I have not actually got round to printing any pictures off for it yet, (another to-do list favourite!) but I plan on using one of the three of us from a day out to the New Forest where we're all windswept and smiling as it's such a happy, natural photo. In case you hadn't guessed from some of these images, I am a serial luxury carrier bag hoarder. Yup. I just can't seem to bring myself to throw out pretty bags; or any packaging for that matter (both my parents are hoarders of all sorts - so I fully hold them responsible for this trait!) Therefore, I came up with a novel and unique way of utilising them (I'm not taking full credit for the idea entirely - I am sure I must have been inspired by Pinterest or something similar), by putting a small vase inside with some faux flowers inside - voila! The bags are not just stockpiling in a cupboard somewhere collecting dust and taking up valuable storage, and it looks a little more quirky and individual. I'm also terrible with empty perfume bottles - they're just too pretty to throw out! So they're often kept among my useable bottles as display. There are still quite a few changes I'd like to make to this room, just to really finish it off, such as adding a large piece of art or photo canvas to the wall at the foot of the bed, as it's such a large expanse of space, it definitely needs something to fill the void. I'd also love to get my dressing table much more minimal - as much as I love all my pretty bits, I'd prefer to get a few shelves up and pop them there, keeping that space fairly empty, bar a vase of flowers and Jo Malone candle of course, (because, you know, blogger requirements). I'd also like to get a bit more storage for my makeup and beauty products, which is the one thing that's proving fairly difficult at the moment due to the lack of space the bay window provides. Ideally, I'd also really love to paint over the magnolia walls with a fresh, bright white, but because we are renting, it just doesn't feel like it's worth the effort if we would have to paint back over it again when we moved out. Which, realistically, probably won't be for quite a while but still, a lot of effort. 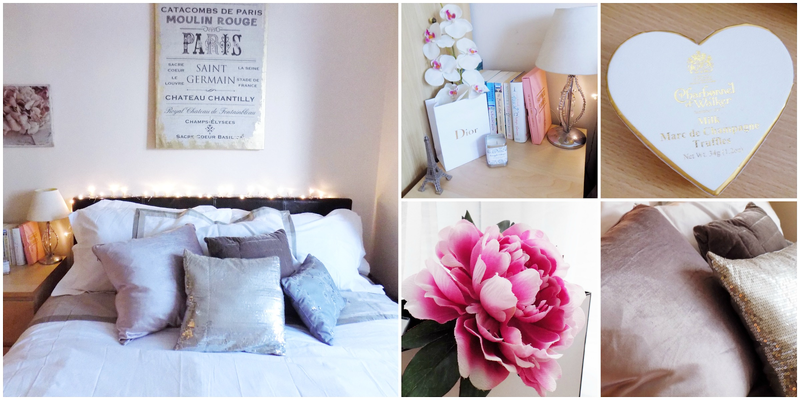 So there we have it, my first room makeover of 2016, and, well, ever actually! Next I want to update the bathroom and living room a bit, perhaps just changing up the colour schemes slightly to make it fresh again. 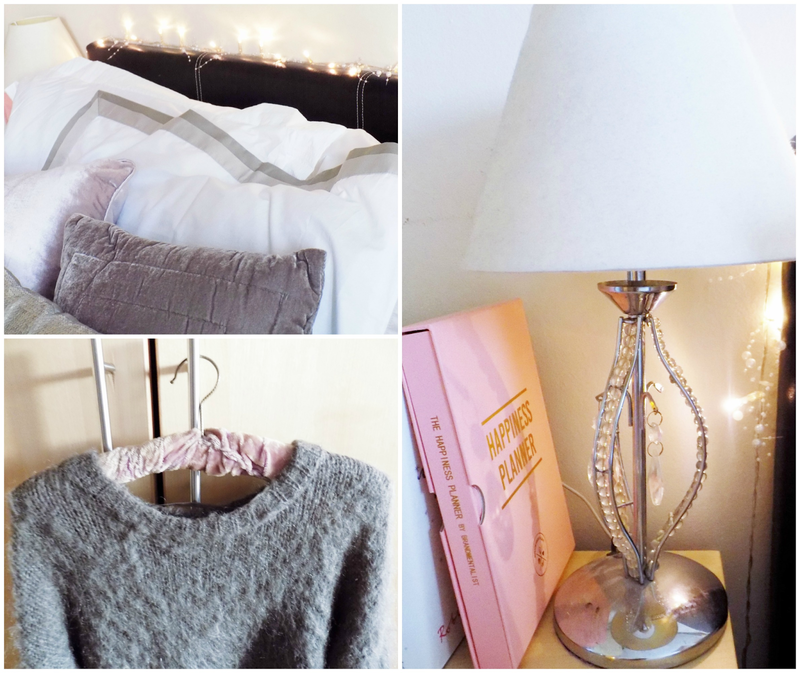 I hope you enjoyed this rather hefty post, and perhaps even gave you some inspiration of your own - if not creatively, then maybe just to go and do it, if like me you've had other jobs take priority over a little room update. It's definitely good for the soul, to have an aesthetically pleasing living space. Let me know what you think of this as I'd love to do more interior based posts, so would be interesting to see if it is well received. Also, if anyone has any clever storage solutions for beauty products, let me know! 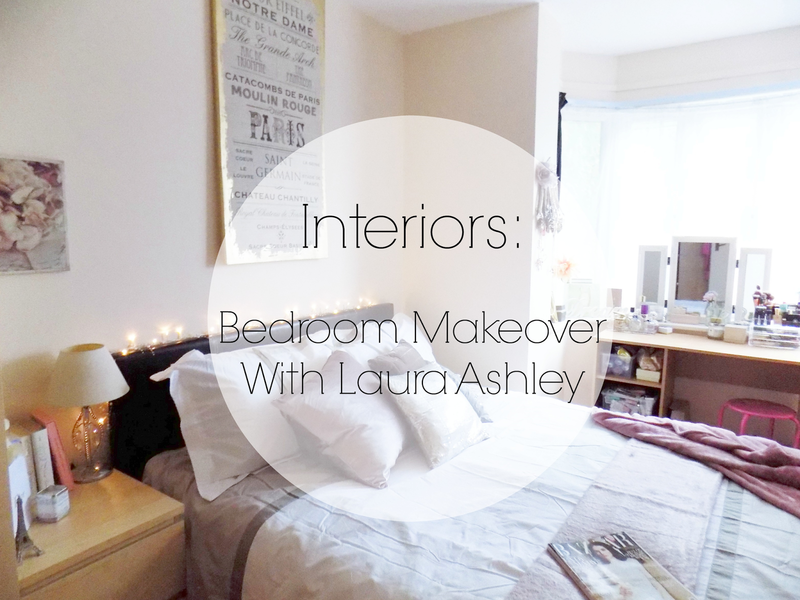 Thank you once again to Laura Ashley for all the beautiful pieces to help recreate my bedroom! All your photos are so beautiful! I love this room! Btw have you ever thought of using paragraphs in your text? The way that's in there, so tightly packed with your pretty photos makes it a bit harder to read.